Pack of assorted solid Stop Corks. Made of Silicon Material . Owing to our expertise in this field, we are engaged in offering a wide range of Wooden Corks. 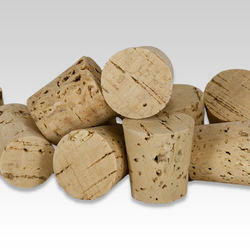 These corks are manufactured with the help of latest technology and high grade raw material. In addition to this, we test these products on various well-defined parameters. Clients can avail these products at market leading prices. We bring forth the best Nichrome Corks for our esteemed clients. Manufactured and designed with steel and other components, these products are highly durable and effective. Furthermore, we ensure to deign these corks adopting advanced technology in accordance with the defined parameters of the industry and clients requirements. With our expertise and trustworthiness, we are engaged in trading an optimum quality range of Silicone Cork. Glass agencies are manufacturer of split cork under erose brand. Rubber crock, natural rubber, shore hardness 45, density 1. 13, temperature range -30° c to 70° c. Light weight & soft, it is resistant to dilute acid, alkalies, ammonia etc. In normal laboratory use. Cork letters would be thoughtful gifts for wine-lovers! We offer a wide range of Metal Crown Corks that are available in different color printing. These are made of metal sheet like tinplate and TFS to enhance the durability at clients end. Moreover, our products are used in varied industries such as soft drinks, breweries, juices and water industries.